Rate of loss of biodiversity may vary from country to country depending on the ecosystems present, protection policies and monitoring, environmental viewpoints and stage of economic development. In this unit we will identify the factors that lead to biodiversity loss. You will also look at case histories of biological significance that is threatened by human activities. You should know the ecological, socio- political and economic pressures that caused or are causing the degradation of the chosen area, and the consequent threat to biodiversity. This unit is a minimum of 4 hours. To what extent have the solutions emerging from this topic been directed at preventing environmental impacts, limiting the extent of the environmental impacts, or restoring systems in which environmental impacts have already occurred? How are the issues addressed in this topic of relevance to sustainability or sustainable development. In what ways might the solutions explored in this topic alter your predictions for the state of human societies and the biosphere some decades from now? What indicators can be taken to suggest that a species is a threat from extinction? How can the population of a species facing extinction be restored? What threats do biologically significant areas face and how can the extent of the environmental impacts be limited? What issues arise when attempts are made to balance conservation with economic development? What conflicts exist between exploration, sustainable development, and conservation in tropical biomes? 3.3.U1 Estimates of the total number of species on Earth vary considerably. They are based on mathematical models, which are influenced by classification issues and a lack of finance for scientific research, resulting in many habitats and groups being significantly under-recorded. ​There are 8.7 million eukaryotic species on our planet — give or take 1.3 million. The latest biodiversity estimate, based on a new method of prediction, dramatically narrows the range of 'best guesses', which was previously between 3 million and 100 million. It means that a staggering 86% of land species and 91% of marine species remain undiscovered. Knowing just who we share the planet with is of particular concern now because global warming, deforestation and other signs of human development are threatening many species, which may be essential to the functioning of ecosystems or may have inherent value in terms of developing medicines or other products. One of the reasons we can’t get an accurate count is that the bulk of the things that have yet to be discovered and described are in the realm of the very small: insects, bacteria and other microbes. 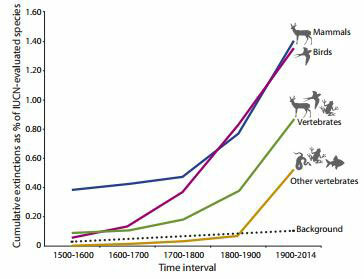 3.3.U2 The current rates of species loss are far greater now than in the recent past, due to increased human influence. The human activities that cause species extinctions include habitat destruction, introduction of invasive species, pollution, overharvesting and hunting. t has now become clear that the loss of biodiversity scientists have been reporting for the last few decades is more than the usual fluctuations seen in ecosystems. The current extinction rate is now approaching 1,000 times and may climb to 10,000 times during the next century, if present trends continue.” In 2005 the Millennium Ecosystem Assessment reported that 10-30 percent of mammal, bird, and amphibian species are threatened with extinction because of human activity. 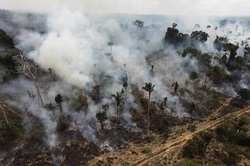 Habitat: habitat loss is the major cause of loss of biodiversity, which is caused by human activities either destroying or changing natural habitats. Overpopulation has led to more and more habitats being degrade in order to accommodate human activities like agriculture, which is needed to support the human population. Habitat fragmentation is the process whereby large natural areas are separated by roads, towns, fences, fields, etc...This leads to a decrease in ecological interactions between species and the isolation of populations. This also leads to the interaction of wild and domestic species which could spread diseases between the populations. Overexploitation: hunting and harvesting of food resources has led to overexploitation of the environment. If we exceed the maximum sustainable yield of any species then the population is no longer sustainable. Agriculture: has caused many environmental problems. The introduction of monoculture (growth of one species), fertilizers and pesticides, as well as the introduction of genetically modified species has caused instability in the environment. Pollution: destroys and degrades habitats. Pesticides, fertilizers, factory emissions, and oil spills, have caused tremendous amounts of damage to the environment and climate change, which has altered weather patterns and shifted biomes away from the equator. This has disrupted the suitability of ecosystems to support the range of species naturally supported there. Introduction of non-native species: has caused instability in many habitats. It disrupts natural ecological interactions and niches, which causes great problems for the ecosystem. 3.3.U3 The International Union of Conservation of Nature (IUCN) publishes data in the “Red List of Threatened Species” in several categories. Factors used to determine the conservation status of a species include: population size, degree of specialization, distribution, reproductive potential and behaviour, geographic range and degree of fragmentation, quality of habitat, trophic level, and the probability of extinction. The conservation status of a species is an indicator of how likely it is to remain alive at present or in the near future. Many factors are used to assess a species' conservation status, including: the number remaining, the overall increase or decrease in the population over time, breeding success rates and known threats. The IUCN Red List of Threatened Species is the best-known worldwide conservation status listing and ranking system. Definitions of the conservation status categories are not required and the term “criteria” has been avoided due to the complexity of the Red List classification system. area of occupancy and probability of extinction. Narrow geographical range: species lives only in one place, if it is degraded or destroyed their habitat will be affected or gone. Small population size or declining numbers: smaller populations have smaller genetic diversity and are less resilient (large predators and extreme specialists e.g. snow leopard and tiger). Low population densities and large territories: if species requires large area to hunt and only meets others to breed then habitat fragmentation and degradation will greatly affect it. Few populations of the species: more populations of a species (in different locations) the better the chances of survival. Low reproductive potential: species which reproduce slowly and infrequently (e.g. whales, and larger seabirds e.g. albatrosses which only produce one egg per pair per year). Seasonal migrants: long migration routes (e.g. swallows, southern Africa to Europe), hazardous journeys, and they need both habitats. If one habitat is destroyed or degraded and then there is no food for them. Barriers on their journeys (e.g. salmon trying swim upstream). Poor dispersers: species that can not move easily to new habitats are vulnerable. For example plants rely on seed dispersal to move which can take a long time and climate change can cause the plant to die before it can move. Flightless birds of New Zealand are almost extinct because they can not escape hunters or fly to new islands. Specialized feeders or niche requirements: for example giant pandas, which eat mostly bamboo and koalas, which eat only eucalyptus leaves, can only survive on one food resource. 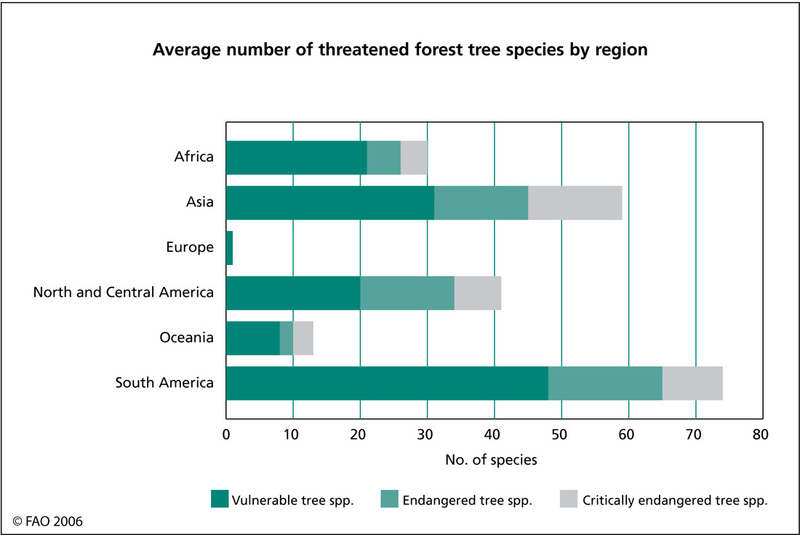 3.3.U4 Tropical biomes contain some of the most globally biodiverse areas and their unsustainable exploitation results in massive losses in biodiversity and their ability to perform globally important ecological services. Rainforests once covered 14 percent of the Earth's land surface, now they cover 6 percent and experts estimate that the last remaining rainforests could be consumed in less than 40 years. Globally 2.4 (1 hectare) acres of rainforest have been destroyed every second... it is the equivalent of two US football fields put together. 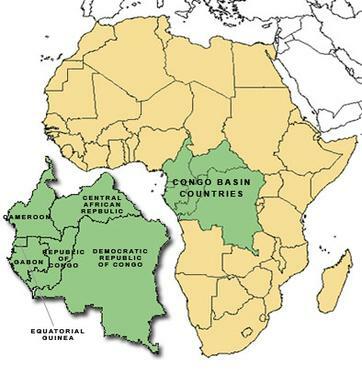 ​3.3.U5 Most tropical biomes occur in less economically developed countries (LEDCs) and therefore there is conflict between exploitation, sustainable development and conservation. You will need to know the ecological, sociopolitical and economic pressures that caused or are causing the degradation of the chosen area, and the consequent threat to biodiversity. Description: Large flightless bird endemic to the island of Mauritius. Ecological Role: No major predators on Mauritius so dodo had no need to develop flight. Dodo was a ground-nesting bird. Pressures: In 1505 Portuguese sailors used discovered Mauritius and used it as a restocking point on their voyages to get spices from Indonesia. They ate the dodo as a source of red meat. Later the island was used a penal colony (jail/prison) and rats, pigs and monkeys were introduced. These ate the dodo eggs and humans killed the dodo for sport and food. Crab-eating macaque monkeys introduced by sailors also seemed to have an impact as the stole the dodo eggs. The later conversion of forest to plantation also destroyed their habitat. It was known to be extinct by 1681. Consequences of disappearance: Island fauna impoverished by its loss. Description: A tropical parasitic plant in the forests of South-East Asia, parasitic on a vine. Ecological Role: These plants are single sexed (male or female) and pollination must be carried out when the plants are flowering. Therefore a male and female plant in the same area must be ready for pollination at the same time. The seeds are then dispersed by small squirrels and other rodents and must then reach a host vine. Pressures: The Rafflesia plants are vulnerable because they need very specific conditions to survive and carry out their lifecycle. They are also vulnerable to deforestation and logging which destroys their habitat. Humans damage them and fewer plants means less chance of breeding. Methods of restoring populations: In Sabah, Sarawak (Malaysia), and Sumatra (Indonesia) sanctuaries have been established. There are also many environmental and educational programs being set up to educate the public on this endangered species. Description: The Australian saltwater crocodile can grow up to 5m long. It is a bulky reptile with a broad snout. It lays up to 80 eggs each year, which take up to three months to hatch. Crocodile take 15 years to mature. The Australian saltwater crocodile was listed as a protected species in Australia in 1971, and is protected under CITES, which ban trade in endangered animals. Ecological Role: The habitat is estuaries, swamps and rivers. Nests are built on the banks in a heap of leaves. The eggs are food for dingoes, pythons, and other small animals. Older crocodiles eat young crocodiles, mud-crabs, sea snakes, turtle eggs and catfish. Baby crocodiles eat tadpoles crabs and fish. It is a top predator. Pressures: The saltwater crocodile was exploited for its skin (leather), meat, and body parts through illegal hunting and smuggling. It was hunted for sport and was often deliberately killed for attacks on humans. Method of Restoring Populations: To restore the crocodiles populations there was a sustainable use policy, with limited culling of wild populations, ranching (collecting eggs and hatchlings and raising them in captivity) and closed-cycle farming (maintaining breeding adults in captivity and harvesting offspring at four years of age). The exploitation of farmed animals reduces the hunting of wild crocodiles. Visitors tour areas to see wild crocodiles (ecotourism) so they are now a valued species. This policy was supported by the Species Survival Commission (SSC) of IUCN but was viewed by other as treating crocodiles inhumanely. introduction and/or escape of non-native species; pollution; hunting, collecting and harvesting. Conservation needs to work at the local grass roots level to create meaningful change in the communities that live alongside conservation areas. 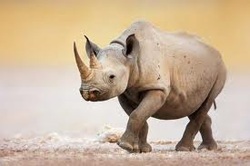 International organizations are important for enforcing the Convention on International Trade in Endangered Species (CITES) agreement, assessing global status of species’ numbers and influencing governments. 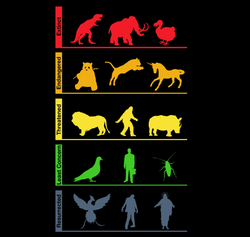 The science of taxonomy is important to understand species extinction. Major surveys are carried out using international teams of specialists. There may be long-term consequences when biodiversity is lost—should people be held morally responsible for the long-term consequences of their actions? The story centers around the sudden disappearance of honey bees from beehives around the world, caused by the poorly understood phenomenon known as Colony Collapse Disorder or CCD. Although the film does not draw any firm scientific conclusions as to the precise cause or causes of CCD, it does suggest a link between neonicotinoid pesticides and CCD. Photographer Joel Sartore portrays some of the world's most imperiled creatures—from whooping cranes to wolves—before they become extinct. Throughout humankind's history, we've driven species after species extinct: the passenger pigeon, the Eastern mountain lion, the dodo .... But now, says Stewart Brand, we have the technology (and the biology) to bring back species that humanity wiped out. From bears to pandas and sharks to coral reefs; some 20,000 of the world's plant and animal species are currently threatened with extinction according to the International Union for the Conservation of Nature. 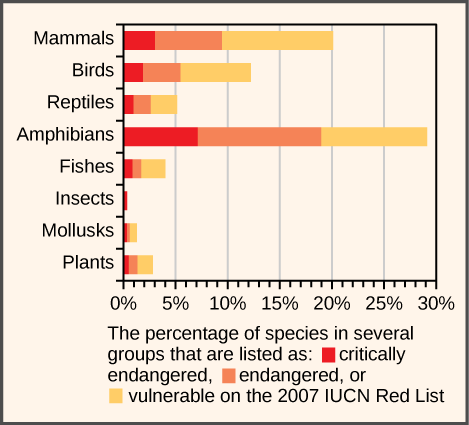 The group's Red List of Threatened Species identifies populations most at risk with the aim of promoting biodiversity conservation. 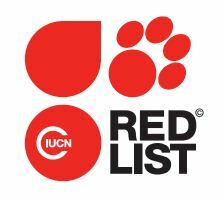 The IUCN Red List of Threatened Species™ is widely recognized as the most comprehensive, objective global approach for evaluating the conservation status of plants, animals and fungi. The IUCN Red List includes a wealth of information which is used to identify the pressures that are pushing species towards extinction across the world. IUCN video about the crisis of biodiversity and species extinction, and the main causes of it. The Rainforest Alliance Sustainable Forestry Management Program in the Peten region of Guatemala provides training, technical assistance, and marketing support for sustainable forestry management, tourism and hospitality businesses. These efforts are part of the Rainforest Alliance's broader effort to transform the global tourism industry into one that benefits the planet and local communities. Tropical Rainforest takes you on a 400 million year journey to illustrate the diversity and beauty of life in the forests. Featuring the birds and primates of the forest canopy and insects of the forest floor, Tropical Rainforest also shows the adventure of researchers challenged to understand the forests even as they disappear. From extreme close-ups to tree-top panoramas, the film lets you experience the forest on its own terms, to better understand and appreciate the treasures of this environment. Most palm oil is produced in Malaysia and Indonesia on land that was once thriving rainforest. As global demand grows, more and more forests are being cleared. 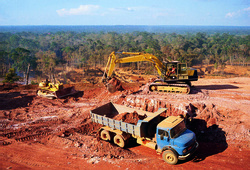 In areas such as Borneo and Sumatra, rich in biodiversity, deforestation can be catastrophic. Endangered species including orang-utans, tigers, elephants and rhinos are losing critical habitats, pushing them toward extinction.